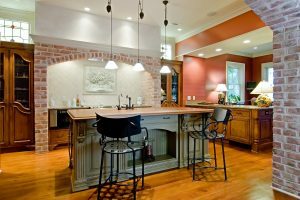 If you have solid surface countertops, then you are likely already aware of the many great benefits of this type of countertop. Solid surface countertops are extremely affordable and attractive when used in any room due to their seamless appearance and design varieties. One of the most beneficial characteristics of these countertops is that they are practically nonporous and very hygienic since they are made out of a synthetic acrylic which repels dirt and bacteria. Also, these countertops are very easy to repair. If you do happen to scratch or damage your solid surface countertops over time, a professional can easily restore them. However, if you would rather prevent any damage before it happens, here are some helpful tips on how to keep your countertops looking like new. The nonporous acrylic used to make these countertops is especially prone to being scratched or nicked, so it is essential that you use a cutting board whenever cutting meats or vegetables on this countertop. You should also be wary when placing any objects with sharp edges on your counter. Solid surface countertops are not very heat resistant and can experience extreme damage or distortion if hot objects are placed on them. Although even heat damage can likely by repaired by a professional with these countertops, you want to avoid putting any hot objects on them. Obviously, pots, pans, and baking sheets fresh from the oven needs to be placed on top of your stove or on a different surface. You may also want to avoid leaving hot mugs directly onto your countertops just in case. You’ll love how easy these countertops are to maintain. They do not fade over time and only need regular basic cleaning. When cleaning your solid surface countertops, it is a good idea to use a microfiber cloth or other type of non-abrasive cloth to avoid any scratching.